The 2T CONCEPT - Sitting Safely? OVERVIEW. The 2 TILT (or 3M) chair CONCEPT. The concepts derived from the scientific evidence. see ☛Biomechanics→ . 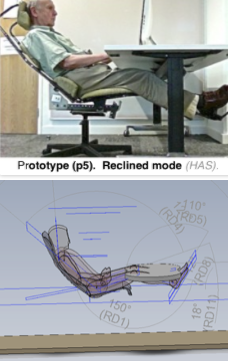 It is the optimised default against which the ergonomics of any chair can be assessed. An essential standard for chair designers. 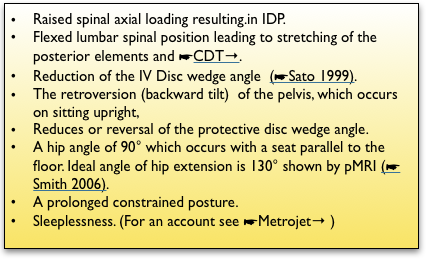 Additional mechanical factors, such as flexion and rotation are required for disc prolapse to result. 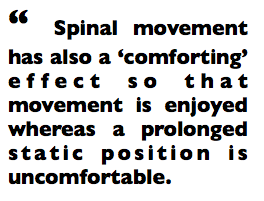 A kyphotic, flexed lumbar spinal position leading to stretching of the posterior elements and ☛CDT→. Reduction of the IV Disc wedge angle (☛Sato 1999). The retroversion (backward tilt or to an an anatomist a ‘forward tilt’) of the pelvis, which occurs on sitting upright, reduces or reverses the protective disc wedge angle. A hip angle of 90° which occurs with a seat parallel to the floor allowing the hip extensor muscles (hamstring & glutei) to rotate the pelvis so as to flatten the lumbar lordosis. 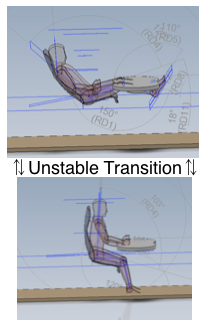 Ideal angle of hip extension is 130° shown by pMRI (☛Smith 2006). These are described further under ☛ Remediation→. Only a reclined posture, basic to the 2Tilt chair concept, can reduce all these and this must be the only logical system for a prolonged working position. 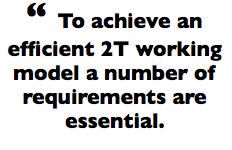 Essential REQUIREMENTS for the 2Tilt concept. Prolonged sitting tasks should be performed in the reclined position with the backrest at 40-45° from the horizontal using a normal desk. This can be reduced with a desk-less version. Support is given to the whole length of the body, from head to feet. pMRI studies have confirmed that the risk of posterior disc displacement is avoided by supine or semi-supine positions.(Smith,2006). In the reclined mode some requirements are necessary to ensure optimal support and must include the following. Requirement 1 Support is given to the entire length of the body, from head to feet with a back support correctly configured to spinal morphology, with iliac support at correct level and shape. Requirement 2. Even with the reduced axial loading the lumbar lordosis should be maintained and this is best effected by some pelvic (not lumbar) support. This should only be sufficient to avoid lumbar flattening, and should avoid excessive lordosis. Requirement 3. Some extra curve (kyphosis) of the thoracic spine, over that which pertains on standing, is allowed because it is fully supported and is a stable area and not liable to mechanical breakdown. It extends, with the upper lumbar joints, over 14 segments and the extra flexion at any single joint is minimal. Requirement 4. A correctly placed head/neck-rest is required so that the occupant has no need to move the neck to establish the task-related visual field. Requirement 5. It is necessary to have support for the legs and feet. Compression of the calf muscles should be avoided. A spring exercise system is an advantage. The floor is allowed as a foot-rest if the knees can remain extended. Requirement 6. Variability at head and feet only. These are the most variable parts of the human body, in the reclined mode. Adjustments avoided elsewhere. ☛Adjustments→. A reclined 40-45° position is advised for a stand-alone 2T chair. Greater angle, nearer fully supine, is possible with a deskless work station ☛4M OFFICE WORK-STATION→. • Requirement 7. Maintaining the wedge angle of the lower two lumbar joints, in the upright mode, can be achieved by a ☛forward tilted seat (FTS) or by correct use of ☛ iliac support. The latter cause additional design problems in this case and so is not recommended for an original design but may be convenient for modification of an existing model. Principle 3. An unstable transitional mode. • Requirement 8. Mid ranges should be unstable and easily negotiated. It is necessary to be able to switch rapidly and easily from a reclined to the upright mode. This is mainly for convenience but the switch also results in a change of pressure on the disc and this has the added advantage of providing a pumping action which aids disc nutrition. (Requirement 10) The 4M deskless work station with standing mode. This entry was posted in Chair REMEDIATION on October 13, 2013 by Dr. Henry Sanford.